Many urban centers, like Shanghai and Shenzhen, have gone from modest fishing villages to booming megacities. China is rapidly urbanizing. More than half of China's population now lives in cities, and over 100 Chinese cities have over 1 million people each. Many urban centers, like Shanghai and Shenzhen, have gone from modest fishing villages to booming megacities. Others have become mega-ghost cities — high-tech (often luxury) urban centers that fail to attract many residents. Here's a look at some of China's largest real estate developments that will change its cities even more. Set to be complete by 2020, Nanhui will be a "satellite city" (kind of like an urbanized suburb) in the Pudong area of Shanghai. It's over a decade in the making. Construction, including residential complexes, eight university campuses, a museum, offices, plazas, and retail began in 2003. 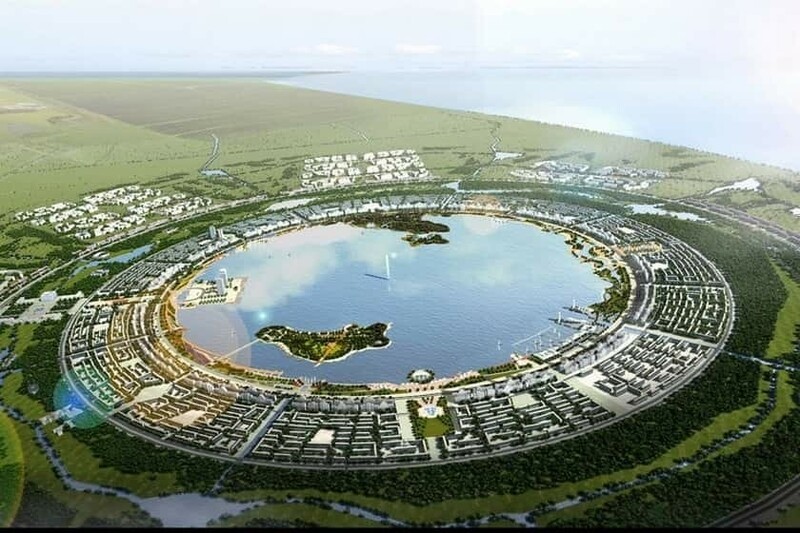 Designed by the German architects Gerkan, Marg, and Partners, Nanhui New City plans to attract 800,000 residents and reportedly cost $4.5 billion. Designed by the UK-based architecture firm Broadway Malyan, the Chengdu Creative Centrewill be a business and residential park in Chengdu. 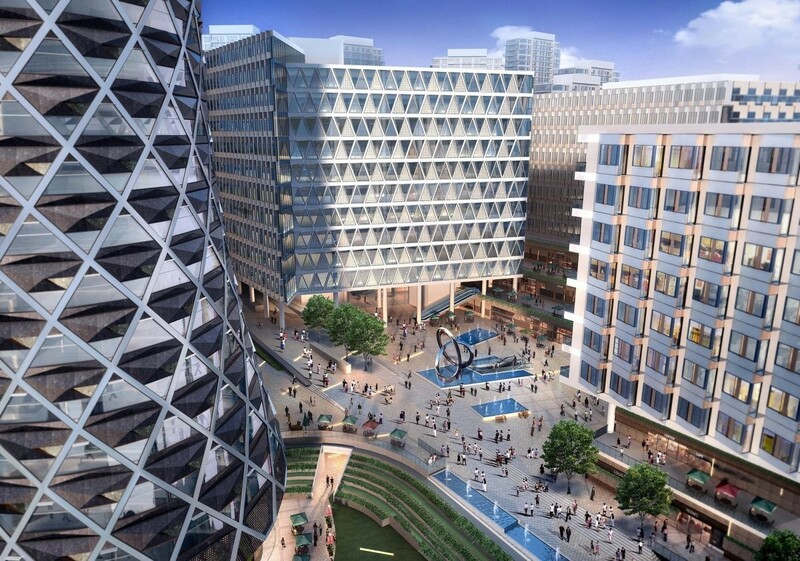 The 2.9 million-square-foot district will feature offices, retail, and green spaces. 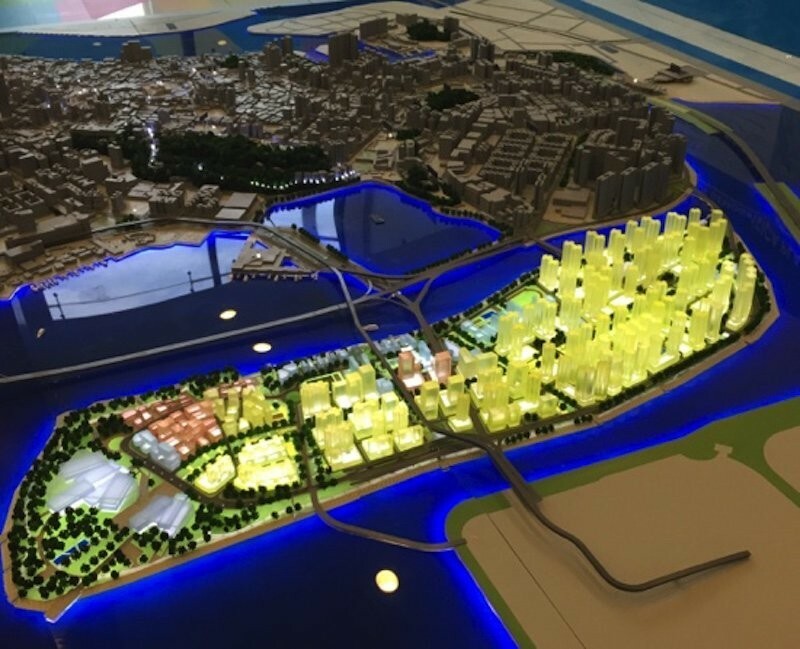 It is the first phase of a larger, longer-term city development project, called Tianfu, which will span 609 square miles and several counties in Chengdu. Plans for the next phases have not yet been released. When complete by 2020, Chengdu Great City — a city located about two miles outside Chengdu — will create enough housing to accommodate 80,000 people. The development will be less car-dependent than most metropolises in China, according to architects Adrian Smith + Gordon Gill Architecture. For example, half the road space will be devoted to pedestrian traffic, and all homes will be within a two-minute walk of a public park. The architects also say that Chengdu Great City will generate 60% less carbon dioxide than a conventional development of similar population. The project aims to conserve the area's existing farmland and green space — 60% of the site will be preserved for agriculture and 15% will be devoted to parks and other grassy space. 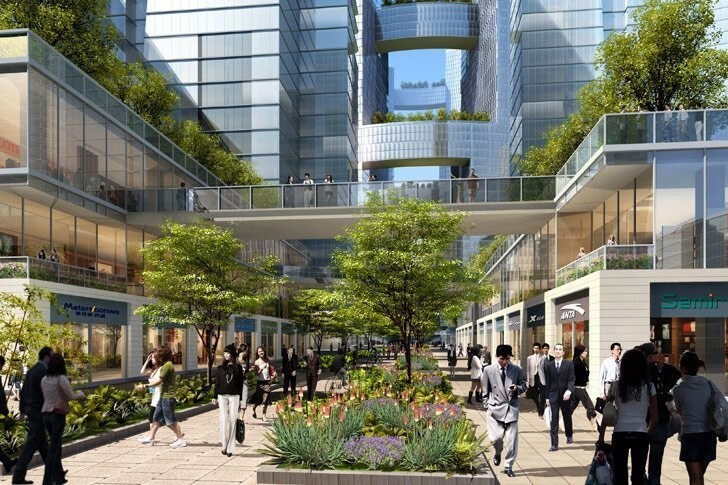 The remaining 25% will feature residential and office space, roads, and sidewalks. The masterplan also includes a transit stop to connect to Chengdu. Construction began on the 13 million-square-foot project in 2012. The Macau New Urban Zone is a 2.8-square-mile land reclamation project in Macau, China, set to be complete by the end of 2017. The land was previously lost to the Praia Grande Bay. As one of the largest reclamations in Macau's history, it will add over 12% to the city's land area. Starting in 2018, the site will be reserved mostly for public housing projects and green spaces, divided up into five zones. Zone A will feature housing for 57,000 people; Zone B will house offices, shops, 2,000 housing units, and a promenade; Zones C, D, and E will have 22,000 housing units, more retail, and green space. Shanghai is planning a 250-acre agricultural district, called Sunqiao Shanghai, which will function as a space to work, live, shop, and farm food. 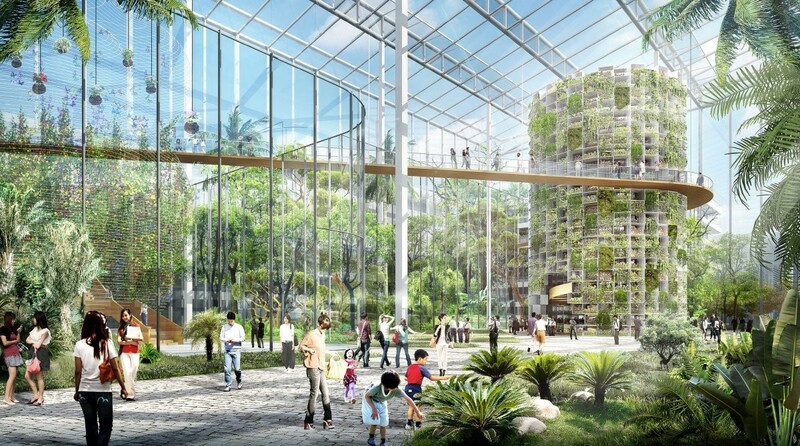 It will include public plazas, parks, housing, stores, restaurants, greenhouses, and a science museum. Some of the crops will be grown hydroponically indoors (i.e. under LEDs and in nutrient-rich water rather than soil). The masterplan was conceived by the design firm Sasaki. There isn't a construction timeline yet, but Sasaki Principal Michael Grove estimates that a crew will break ground on the project by 2018. Established in April 2017, Xiongan New Area is a redevelopment project planned for Hebei, China. Initially, the city will cover nearly 40 square miles, but eventually it will reach about 80 square miles — over three times the size of Manhattan. The masterplan and construction timeline is not yet set, but city officials say that it will include new housing, offices, universities, and a transit system. 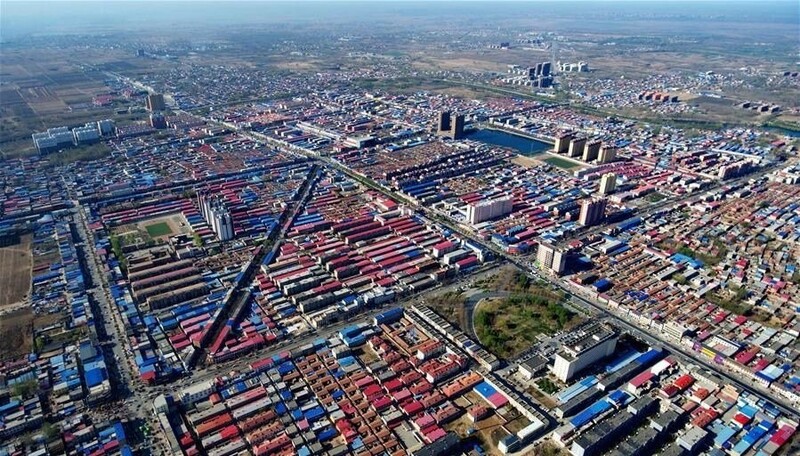 Xiongan is being billed as a "special economic zone" and future tech hub by the Chinese government, which hopes that populations from nearby Beijing will move there (and thus reduce congestion in the city). Analysts expect it to take 15 years for the city to absorb 4.5 million people, many of whom are already trying to move there. Prices of existing housing in the area have recently skyrocketed as a result, according to The Economist. The Chinese government has spent billions of dollars constructing Yujiapu Financial District, nicknamed "China's new Manhattan" (There are even skyscrapers inspired by Rockefeller Center and Lincoln Center). Construction on the 1.5-square-mile site started in 2008, and will total an estimated $30.4 billion. 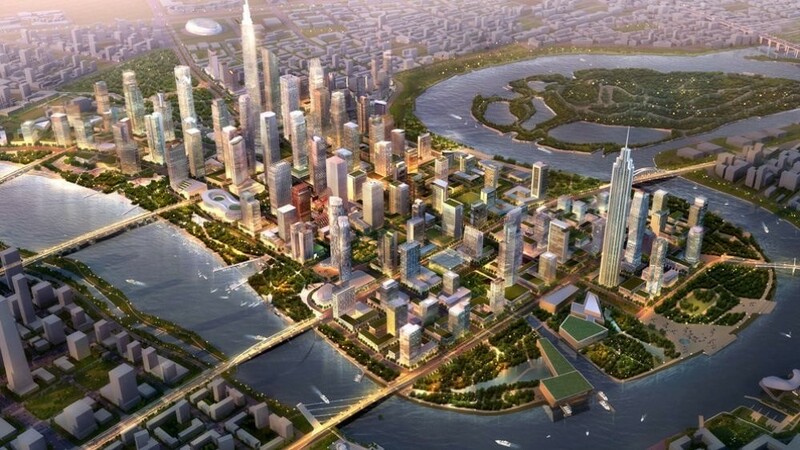 Located outside Tianjin, it will feature 47 new residential and office towers when complete in 2019. But so far, it may be shaping up to become a ghost city, full of half-built and rarely occupied skyscrapers, according to Bloomberg and CNN.